I can't take credit for this recipe; my Mum came up with it after seeing a meaty version on a TV foodie show. I'm posting this for the benefit of a friend. I'm not a professional recipe writer, so attempt it yourself at your own risk. 1 packet of 6 Linda McCartney's sausages, (or whatever sausages you like). 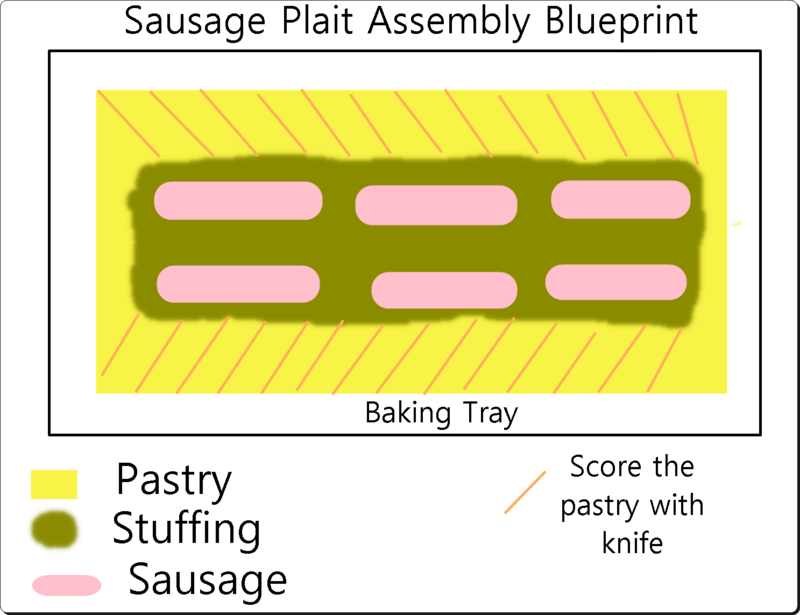 You will also need a large baking try to assemble the plait on in addition to run-of-the-mill kitchenalia required for preparation. [See, I said I wasn't a professional food writer]. Pre-heat oven to 180 C / 350 F / Google it for gas. Finely chop the onion and fry it in some oil until it is soft. While the onion is cooking, prepare the dry stuffing mix as per the instructions on the packet but dissolve the two oxo cubes into the boiled water to add extra flavour. Add the large dollop of margarine and the cooked onion to stuffing and mix thoroughly. I don't add any other seasoning because the sausages are quite salty and the oxo cubes are quite savoury, but you can if you want to. 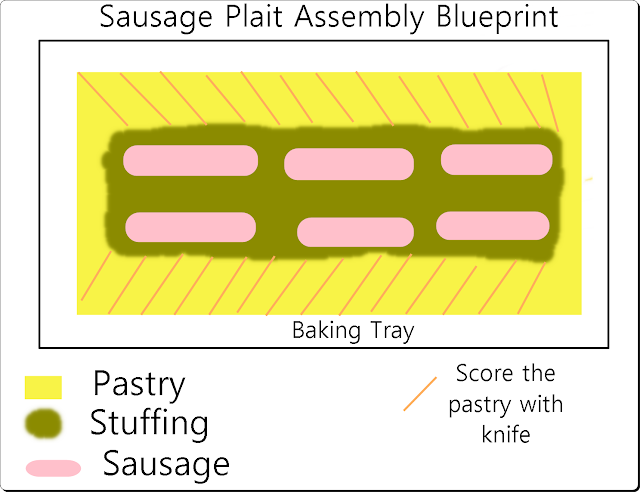 Next, grease your baking tray with oil and unroll the pastry. Put the pastry on the tray and spread HALF of the stuffing mixture onto the pastry (see my fabulous diagram below - I'd have taken photos of the whole process if I'd realised I was going to do this blog). 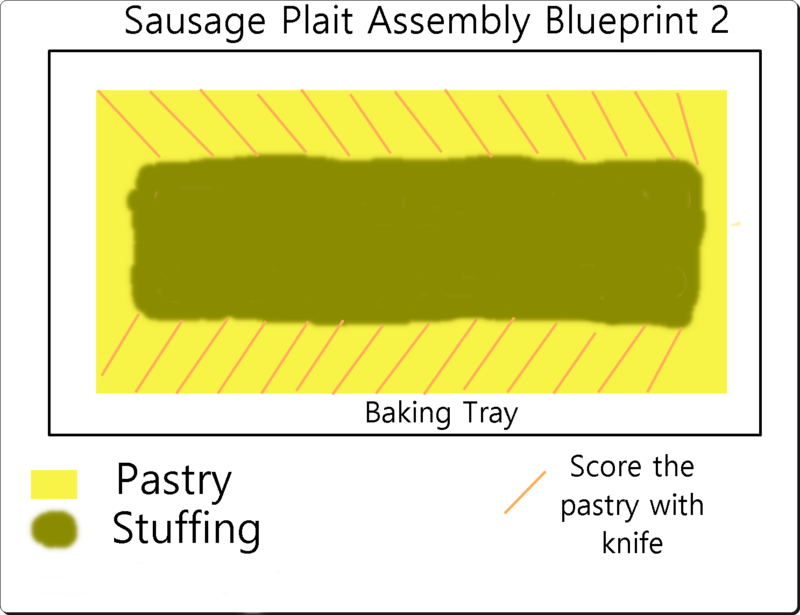 Cover the sausages with the remaining stuffing mixture - see diagram below. You can then plait the pastry across the top of the stuffing, or roll it up if you've opted to make the wellington. Once you've finished this, mix a small amount of sunflower oil with some soya milk to glaze the top of the pastry. This will make it go a nice golden brown, but is not essential. If you find that the pastry is getting too brown too quickly you can cover it with foil so that it doesn't burn. Here's my finished version. It goes well with a roast dinner and gravy and is also nice cold with salad or HP sauce, chips and beans. YUM. Post a comment if you have any questions or think I've missed anything. I made some rose buds using the left over pastry for this one that I served up on Christmas Day. My Mum and Owen, independently of each other, both said, "Oooo, I like your snails." I don't know why I bother. 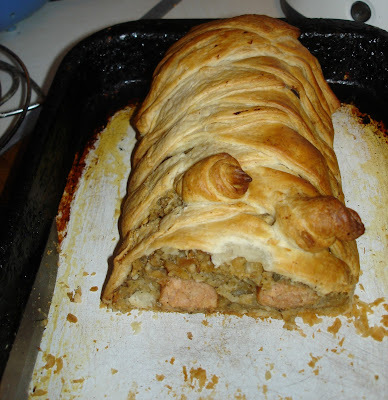 Here's another plait recipe that I found that has better pictures than mine. I haven't made this myself though.